Executives with McDermott International, ExxonMobil, Zachry Group and Chiyoda International after signing a Tuesday morning construction deal for the Golden Pass LNG export terminal project near Port Arthur. ExxonMobil and Qatar Petroleum announced on Tuesday that they are moving forward with the $10 billion project. 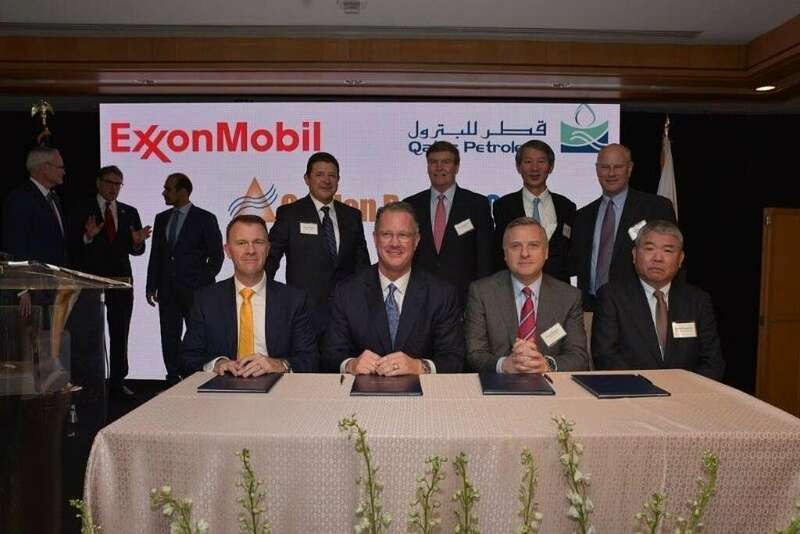 Irving, Texas-based Exxon Mobil Corp. (NYSE: XOM), which has a major Houston presence, and state-run Qatar Petroleum are moving forward on a $10 billion liquefied natural gas export project along the Gulf Coast. The export project will be built at the existing Golden Pass LNG facility in Sabine Pass, Texas, according to a Feb. 5 press release from the joint venture, Houston-based Golden Pass Products LLC. Construction is slated to begin in the first quarter of 2019, per the release. The facility is expected to start up in 2024 and have a capacity of roughly 16 million tons of LNG per year. The project is expected to create about 9,000 jobs during construction and more than 200 permanent jobs once the facility is operational. A joint venture between Houston-based McDermott International Inc. (NYSE: MDR), San Antonio-based Zachry Group and Chiyoda International Corp., which has its U.S. base in Houston, was awarded the engineering, procurement and construction contracts, per the release. Golden Pass also inked a 20-year cornerstone shipper commitment of 1.1 billion cubic feet per day with Oklahoma City-based Enable Midstream Partners (NYSE: ENBL), which is developing the Gulf Run Pipeline to feed the new export facility. Golden Pass also has pipeline capacity on NGPL, or Natural Gas Pipeline Company of America LLC, which is jointly owned by Houston-based Kinder Morgan Inc. (NYSE: KMI) and Toronto-based Brookfield Infrastructure Partners LP (NYSE: BIP). The Golden Pass export project will include three liquefaction trains — with a capacity of about 5.2 million tons per year each — plus other associated utility systems and interconnections to the existing Golden Pass facility, which includes five 155,000-cubic-meter LNG storage tanks, two marine berths to accommodate the largest LNG carriers and the 69-mile Golden Pass Pipeline system. The project might also add compressor stations to the existing pipeline. Another part of the project include expanding the facility’s storm protection levee system. Jefferson County Judge Jeff Branick noted in the release that the area was hit hard by Hurricane Harvey in 2017 and is looking forward to the economic boost from the project. Preliminary estimates project it could “generate up to $31 billion in U.S. economic gains and $4.6 billion in taxes for the United States at local, state and national levels,” per the release. “This expansion represents not only an investment in creating jobs and growing our state’s economy, but also in expanding our nation’s international export reach and energy independence,” Texas Gov. Greg Abbott said in the release. Golden Pass Products, which is 70 percent owned by Qatar Petroleum and 30 percent by Exxon, filed a federal application to export liquefied natural gas from the Sabine Pass site in 2014. Qatar, Exxon and Houston-based ConocoPhillips (NYSE: COP) previously formed a joint venture to own the existing Golden Pass import facilities, but Reuters reported last week that ConocoPhillips plans to sell its 12.4 percent stake, likely to Exxon.